Learn more about why Novartis is taking India to court over the production of affordable generic medicines. 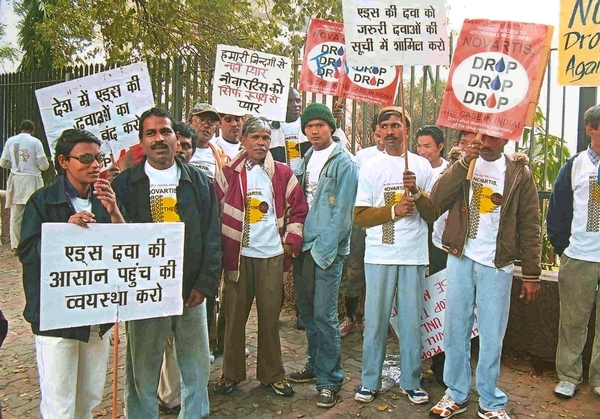 Hundreds of activists gathered in New Delhi to protest Novartis's attack on India's patent laws in 2007. MSF and others continue to oppose the legal case today. Q: Why do millions of people rely on India for affordable medicines? For the past 6 years drug giant Novartis has been pursuing a legal case in India that threatens access to life-saving affordable medicines for millions across the developing world.As the case now opens before the Indian Supreme Court, join MSF & tell Novartis that people matter more than profits. A: Medicines produced by generic companies in India are among the cheapest in the world. That is because, until 2005, India did not grant patents on medicines. India is one of the few developing countries with production capacity to manufacture quality-assured generic medicines. By producing cheaper generic versions of medicines that were patented in other countries, India became a key source of affordable medicines, such as antiretroviral medicines (ARVs) to treat HIV and AIDS. Eighty percent of the medicines MSF uses to treat 170,000 people living with HIV in its projects today are sourced from Indian generic drug companies, and over 80 percent of all HIV and AIDS medicines bought by donors also come from India. In the case of treatment for pediatric AIDS, Indian generic producers supply over 90 percent of medicines used in developing countries. This is why India is known as the "pharmacy of the developing world." Q: What is the relationship between patents and affordable medicines? A: When a pharmaceutical company has a patent in a country, it means it has a monopoly in that country for a certain amount of time. This means it can prevent other companies from producing, selling, or importing the medicine in that country for the duration of the patent term, which, according to World Trade Organization (WTO) rules, is a minimum of 20 years. This in turn allows companies to charge high prices because there are no competitors in the market. In the absence of patents, multiple generic producers produce medicines, further driving the price down. Competition among different producers is the tried and tested way to bring prices down. Competition among generic manufacturers is what helped bring the cost of HIV and AIDS treatment down from over US$10,000 per patient per year in 2000 to $150 today. The absence of patents in India has also helped in the development of three-in-one HIV/AIDS medicines called fixed-dose combination pills, and formulations for children. Q: Aren’t patents needed to stimulate innovation for new drugs by pharmaceutical companies? A: An increasing number of studies have shown that while patent protection has increased over the last 20 years, the innovation rate has been falling, with an increase in the number of "me-too" drugs of little or no therapeutic gain. This undermines the case that is often made by the pharmaceutical industry that more patent protection would result in more investment in medical innovations. A study published in 2005 concluded that 68 percent of the 3,096 new products approved in France between 1981 and 2004 brought "nothing new" over previously available preparations. Similarly, the British Medical Journal published a study rating barely 5 percent of all newly patented drugs in Canada as "breakthrough." And a breakdown of over 1,000 new drugs approved by the US Food and Drug Administration between 1989 and 2000 revealed that over three quarters have no therapeutic benefit over existing products. In addition, the 2006 report of the World Health Organization’s Commission on Intellectual Property, Innovation, and Public Health also found that there was no evidence that the implementation of WTO rules on patents in developing countries significantly boosts research and development in pharmaceuticals for diseases affecting developing countries. Q: Does India not grant patents on medicines at all? A: As a WTO member, India has to comply with trade rules set by the WTO. One of these is the Agreement on Trade-Related Aspects of Intellectual Property Rights, or TRIPS, which obliges WTO member countries to grant patents on pharmaceuticals. To comply with this international obligation, India amended its patent law in 2005 and started to grant patents on medicines. As a result, when patents are granted in the country, Indian generic manufacturers are not able to produce cheaper generic versions of these medicines. This is already beginning to have a significant impact on access to affordable medicines, both in India and beyond, as newer medicines (invented after 1995) are highly likely to be patent protected in India—and many such as raltegravir (for HIV) and pegylated-interferon (for hepatitis C) already are. Q: Why did Novartis attempt to sue the Indian Government? A: Novartis applied for a patent in India on the cancer medicine imatinib mesylate, which the company markets under the brand name Gleevec/Glivec in many countries. In other countries at that time where Novartis had obtained a patent, Gleevec was sold at US$2,600 per patient per month. In India, generic versions of Gleevec in 2006 were available for less than $200 per patient per month. Novartis applied for a patent so that it could sell Gleevec at higher prices in India. The patent was rejected by the Indian patent office in January 2006 on the grounds that the medicine was merely a new form of an old medicine, and therefore was not patentable under Indian patent law. Novartis decided to challenge this decision. A: Novartis’s patent application was rejected in part because of Section 3(d) of India’s patents act. When India amended its patent legislation in 2005 to comply with international trade rules, the Indian Parliament included provisions to protect health and access to medicines. Section 3(d) is one of those provisions. It explicitly requires that patents should only be granted on medicines that are truly new and innovative. For new forms and new uses of existing medicines, Section 3(d) requires patent applicants to prove significantly improved efficacy before a patent can be granted. Imatinib mesylate (Gleevec) is the salt form (mesylate) of an older medicine, imatinib. Novartis claims it deserves a patent on imatinib mesylate based on the fact there is a 30 percent increase in the bioavailability of the medicine in this new form. But according to the guidelines for the examination of pharmaceutical patents developed by the World Health Organization, the selection of a salt of the active ingredient with the purpose of improving bioavailability is well known in pharmaceutical art and is an often-used form of what is known as "evergreening." Evergreening is a practice followed by multinational pharmaceutical companies to extend their patent terms by making minor changes in their existing medicines and claiming the medicine is then patentable. In sum, the Indian parliament introduced Section 3(d) to give explicit guidance on what did deserve a patent and what did not. When Novartis’s patent application on imatinib mesylate was first rejected by an Indian patent office, the company decided to challenge this part of the Indian patent law. Q: Why is this now before the Supreme Court? A: The Supreme Court case is the final act in a legal battle that stretches back over six years over India’s future capacity to act as the pharmacy of the developing world. After its patent application for imatinib mesylate was rejected, Novartis mounted a legal challenge to have Section 3(d) declared unconstitutional in the Madras High Court. In 2007, the High Court rejected Novartis’s plea. In 2009, the Intellectual Property Appellate Board also rejected the company’s appeal against the rejection of its patent application. Having lost its first legal battle to have Section 3(d) completely removed from India’s patent law in 2007, Novartis launched fresh legal proceedings in 2009 at the Supreme Court of India, this time seeking to weaken this critical public health safeguard so that it becomes meaningless. A: Section 3(d) requires demonstration of increased therapeutic efficacy for a medicine to deserve a patent. In this case, Novartis is trying to argue against that "efficacy" should be interpreted differently by the Indian courts and patent offices. The interpretation of the definition of "efficacy" is therefore central to this case, and to the future of India’s role as pharmacy of the developing world. In its first legal battle in the Madras High Court, Novartis argued that increased bioavailability of the salt form of imatinib meant increased efficacy, entitling it to a patent on imatinib mesylate. But at the time, Madras High Court clarified efficacy to mean "therapeutic effect in healing a disease." The rejection of Novartis’s patent application was therefore confirmed. Q: What would happen if Novartis won this case? A: The implications of a Novartis victory in weakening the interpretation of Section 3(d) would not be limited to the patenting of imatinib mesylate or on cancer patients alone. If Novartis won the case, patents would be granted in India as broadly as they are in wealthy countries and on new formulations of known medicines already in use. India would no longer be able to supply much of the developing world with quality affordable medicines. The example of HIV and AIDS medicines is a good illustration of the potential impact of this decision. Even though first-line drugs to treat HIV have become affordable thanks to generic competition, the availability of second-line and improved formulations are crucial, as people gradually become resistant to their current combinations of HIV medicines and need to be switched to second-line medicine regimens. Some of these key medicines have gone into generic production in India but if Novartis wins then this generic production will be endangered, as many drug companies will push for their drugs to be patented in India. If Novartis win the case, more and more treatments will remain priced out of reach for the duration of the patent term—20 years or more—including those that are merely new forms of existing medicine and didn’t deserve a patent in the first place. Q: What is MSF’s role in this case? A: MSF is not a party to the Novartis case, but we stand in solidarity with the Cancer Patients Aid Association (CPAA) in its battle against Novartis. The CPAA is a party to this case and will be arguing for a strict interpretation of "efficacy" so that patents on new forms of known medicines—such as the one on the cancer medicine imatinib mesylate—are not granted routinely by Indian patent offices. Given the potentially huge ramifications on generic production and the availability of affordable medicines from India, MSF, along with many other treatment providers, patient groups, and affected communities has long appealed to Novartis to stop its attacks on the pharmacy of the developing world. Take action: As the case now opens before the Indian Supreme Court, join MSF & tell Novartis that people matter more than profits.